From the Bellybutton of the World to the Plains of the Moon | Small Farmers. Big Change. The following was sent to us from Tom Hanlon Wilde, West Coast Sales Manager, during his visit to Peru and is the third part in the series. We arrived in Cuzco, known in Inca legends as the Bellybutton of the World and a city which sits at an elevation over two miles high. Suffering from the high altitude and gasping for oxygen in the thin air, we staggered our way to COCLA’s coffeehouse for a great cup of joe. 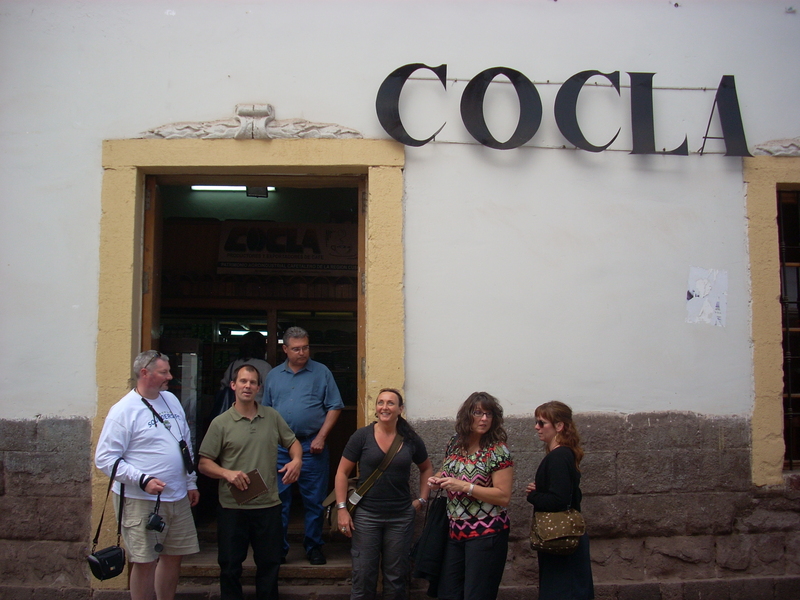 COCLA’s coffeehouse has become a well-visited place in this town, which receives more visitors each year than any other South American city. In the 1990’s, the tiny storefront south of Plaza San Francisco, about four blocks from Cuzco’s central plaza, offered little more than a few dusty bags of coffee and boxes of tea during the sporadic hours it was open. A decade ago, as COCLA began to win back members due to their strong farming training programs and their efficient operation, the co-op decided to invest in their Cuzco location. At first, COCLA simply made the hours more regular and began to offer all the farmers’ produce. Later, tables and chairs were set out to welcome guests and coffee and tea was brewed to order. Then, in 2003, a new micro-roasting operation was set up in the corner, and the delicious aroma of fresh-roasted coffee wafted out the door and brought in the visitors. Now on an average day, the storefront that used to sell just a few packages of food each day sells 200 of cups of coffee and dozens of pounds of coffee, tea, and cacao. We won’t get to savor our drinks too long today, however, because we need to get on the road to drive into the jungle. The road climbs out of the dizzying heights of Cuzco and drops into a valley to follow the mighty Urubamba River. We’ll pass the 20,000-foot high Mount Salkatay and then climb through the super steep Malaga Pass. Last time our group suffered from some serious altitude and motion sickness on the white-knuckle switchbacks at the pass. Wish us luck this time! Through the Malaga Pass we arrive at what locals call the Eyebrow of the Jungle, that easternmost ridge of the Andes that descends into the Amazon jungle. The town of Quillabamba (Quechua for Plains of the Moon) serves as the agricultural center for the valleys of Vares and La Concepcion, which are two of the most fertile and progressive farming regions in all of Peru. It was in these valleys that some of the first sharecroppers organized themselves into unions against exploitative plantation owners. Those union activists were leading voices for land reform and became leaders of their co-operatives in the late 1960s and early 1970s. In this area, it is common to meet farmers who are known nationally for fighting for the rights of farm workers or for their work pioneering organic agriculture. The co-operative movement in Peru dates back to the 1960s when the government passed an agrarian reform program allowing for the creation of co-operatives. Farm worker union members soon found themselves as the owners of coffee growing lands once belonging to their patrons. At the time, middle level traders were taking coffee on consignment, thereby leaving the farmers with no guarantee of receiving a fair price. Looking for a way to sell their crops without being subject to the caprice of these intermediaries, the workers began forming co-operatives. Seven coffee co-operatives, consisting solely of producers in the two valleys of La Convención and Lares, decided to unite their efforts by establishing a “second level” or marketing cooperative. From this effort, the Agrarian Co-operativs of La Convención and Lares,Ltd. #281, was formed on July 26th, 1967. On September 3, 1991, the by-laws were altered and the name was changed to the Agrarian Coffee Co-operative, Ltd. #281, also known by the acronym COCLA. The new by-laws were established by the seven founding co-operatives, which later integrated other co-operatives. Initially the co-operative provided warehousing services, processing, insurance, and accounting services. Later, a Coffee Sales and Financing service was added. Other services which followed soon afterward included business management training, agricultural extension services, and co-operative organizational development assistance. Today, COCLA is an organization on the cutting edge of the national coffee industry and the co-operative movement, and is becoming stronger socially, economically, and technically. In its efforts to achieve social change, COCLA integrates 8000 small scale farming families in the valleys of La Convención and Yanatile. Sister co-operatives in the other areas of Ayacucho, Puno, Huánuco, and Cajamarca also use the services of COCLA.